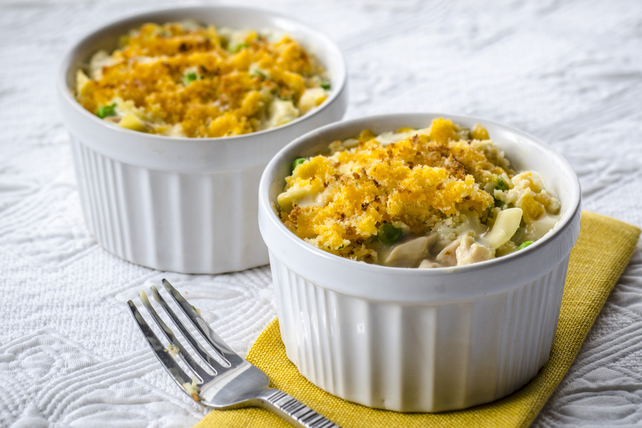 Put on your best apron and go retro tonight with this tasty tuna casserole, made with a simple sauce of condensed soup, milk and cheddar cheese. A crispy bread crumb topping adds the perfect finishing touch. Mix soup and milk in medium bowl until blended. Add macaroni, peas, tuna and 1/2 cup cheese; mix lightly. Spoon into 4 (500-mL) ovenproof dishes sprayed with cooking spray; top with remaining cheese, then bread crumbs. Place on rimmed baking sheet. Bake 20 to 25 min. or until casseroles are heated through and tops are golden brown.